Well, the reason I made this layered pudding is ‘coz I absolutely love puddings. 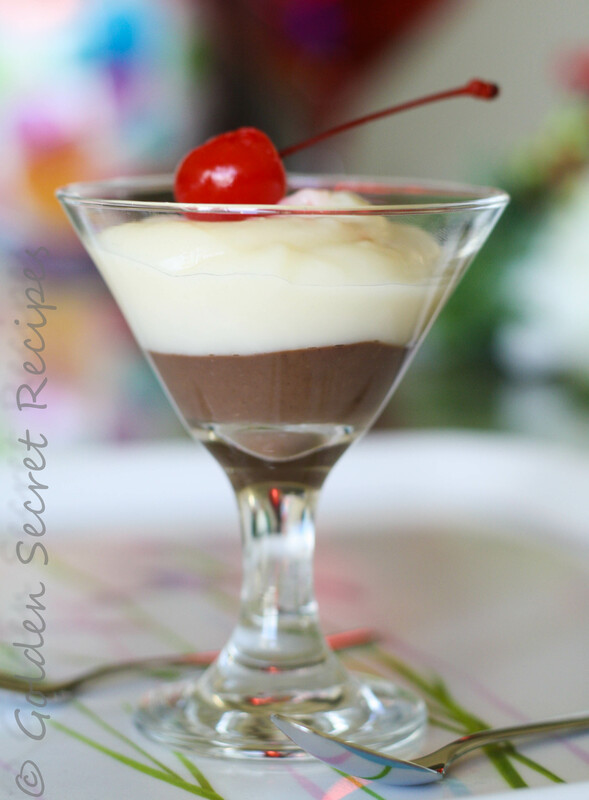 And the combination of chocolate and vanilla is just out of the world 🙂 Even when I eat ice-cream, it is either a scoop of chocolate and vanilla ice cream each or vanilla ice cream topped with chocolate syrup 🙂 So this simple recipe is for all the ‘vanilla and chocolate’ lovers! 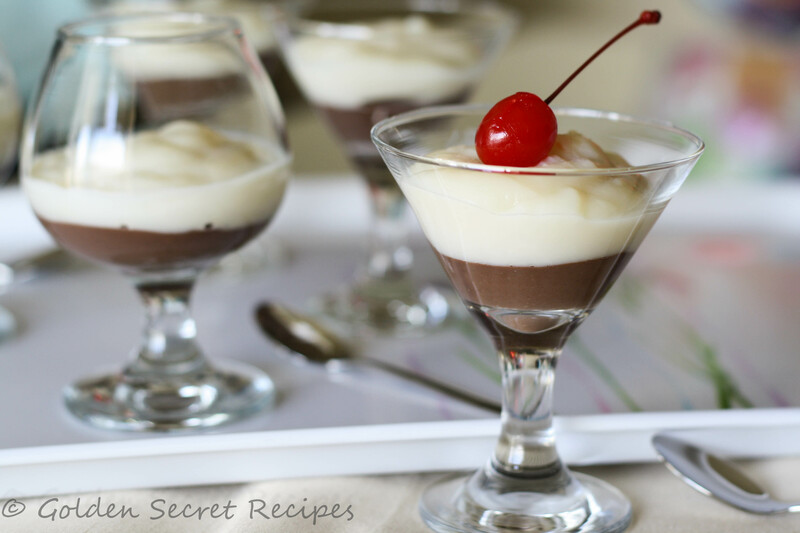 Click on the ingredients to get the recipes for chocolate pudding and vanilla pudding. 1. Get your dessert bowls ready before preparing the pudding. The pudding thickens very quickly once you remove it from heat. So it is good to pour the freshly made pudding directly into the serving bowls and it ensures that it takes a good shape in the bowl. 2. Pour the chocolate pudding into the bowl. Fill 1/3rd of the cup with chocolate pudding. 3. Let it cool down a little. Meanwhile you can get the vanilla pudding ready. 4. Fill the remaining 1/3rd of the cup with vanilla pudding. 5. Refrigerate it for atleast 1 hour. 6. Serve with your choice of topping. It could be topped with a cherry, or a mix of berries/fruits or nuts and raisins. 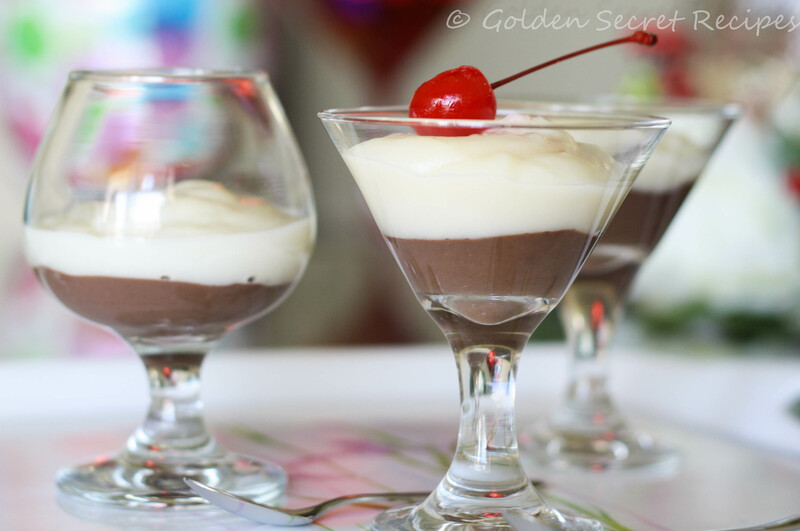 This entry was posted in Quick 'N' Easy Recipes, Sweets 'N' Dessert Corner and tagged chocolate pudding, chocolate vanilla layered pudding, easy dessert recipe, how to make layers of pudding, impressive dessert ideas, layered pudding, Vanilla and chocolate pudding, vanilla pudding. Bookmark the permalink.